Crime Scene Buster – EVERYTHING YOU NEED TO KNOW to create and set up your own crime scene investigation mystery parties. Whatever the age and size of your group, Crime Scene Buster can help you. Crime Scene Buster is organized into Nine Steps. Follow the steps and you end up with a CSI mystery event. Some of the steps have three parts: basic, intermediate and advanced. You only need to do the basic steps. If you are interested in more elaborate mystery parties and/or the mechanics of putting it together, then read the intermediate and advanced sections. The intermediate and advanced sections are not necessary to this book but I feel so passionate and excited about mysteries, that once I start on the topic, I have a hard time stopping! THE CRIME for children’s mystery parties is usually about something being stolen. The stolen item is found at the end of the game. A different crime can be used if you wish. We will use a theft for the crime example but you can just as easily pick a murder for parties with older participants. The format remains the same. This format is based solely on clues found at the crime scene. Figuring out who had the motives, methods, and opportunity to commit the crime is a more complicated structure and not covered in this book. This book is all about the clues. Definitely! If you want to chat before purchasing, email me you # and I’ll give you a call. I work in a small museum and we would like to host a theft of an artifact day with a children’s group. Can the fill in the blank on adapt well to our situation? and can I have a preview of what is included? how many pages, what one of the clues looks like? Is this just a digital file? You might want to check out the info one Fossil Furor as it is about an artifact/fossil stolen from The Mudstone Museum. https://mysteryfactory.com/fossil-furor-at-the-mudstone-museum/ . Be sure to listen to the audio clue. It’s super fun! All mysteries come as a PDF, and the clues are all on paper, however you can substitute real items for them. In example, one of the clues is a bandage, so you can use the bandage pictures provided or use actual bandages, and like that. In Crime Scene Buster, you fill in all the blanks. If you want to chat – and I love to talk about mysteries – send me your phone # and we can set up a call. I’m considering doing a toned down murder mystery party for my 10 year old’s birthday. I’ve been on many websites and most of these parties involve a script. I feel like this one is more about games and dressing up but is there a script as well? If so, how much reading is there? I only ask because my daughter is very smart but is dyslexic. A party where she has to read a lot will not be much fun for her. Let me know! Thanks. Hi Jennifer – Nope, no script. There are a few things that need to be read, such as the police report, letter from the victim, and maybe one or two other things. Usually the mystery starts off at CSI Headquarters where someone reads these documents out loud to the group and the game is on – a mad scramble for clues and crime scene investigation. The bulk of the Casebook you print off is pictures. Just a heads up that you are on the DO-IT-YOURSELF Crime Scene game page and Crime Scene Buster tells you how to put together your own mystery, using the same format as the Gumshoe Detective Series. It’s super fun and can be written specifically to match your groups own interests. And it will take time to put together. If this is the route you want to go and want to chat about it first – send me your number and we can talk. Hi there. I am interested in hosting a party for my to be 9 yo. She wants what sounds like a heist during a high end party (like adult murder mysteries) but since she is only 9 I am sure we can tone it down a lot! The party will be in a few weeks. What should I buy or any advice? Hi Susie – I would go with Crime Scene Buster, where you make up a crime, set the crime scene up, pick six suspects and have some happy-go-lucky adults or siblings play the part and turn the party guests loose, tracking down clues and solving the case. The kids’ mysteries are more games than performances and you don’t necessarily need to have anyone play the characters. Why don’t you email me your number and we can chat so I can give you a better idea of what is involved and you can decide what works for you? What exactly is included when buying the Crime Scene Buster pkg? I have a month to invite and plan. I want something Super easy for a 10 yr old party. Please let me know if this would be easy and suitable!! Thanks Brenda! It was a pleasure doing business with you. Thank you so much Jen. I am busily working on it as we speak! Can you please email me as well when this is finished. 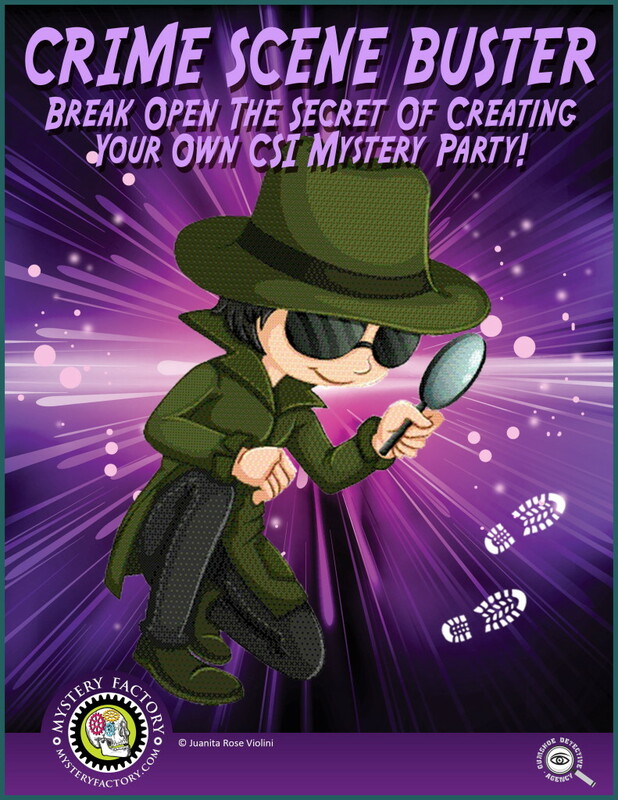 My daughter requested a CSI clue party at the end of Feb and this would be so very helpful. Thank you! When will this be available? I am planning a Pack meeting for Cub Scouts at the end of February and this would be perfect. Ok. I will move it to the top of the list and send you an email when it is completed. Thanks for your comment. Hi Sanett – If you like we can talk on Skype, plot it together and then I’ll send you all the templates, etc that you will need for the mystery. Send me an email jrv(at)mysteryfactory.com if this is of interest to you and we’ll set up a time and talk.It’s pretty fun and we can get it all plotted out in about an hour or so. Consultation rates vary. Apologies, I bought one of your plans and the party is tomorrow the kids are very excited. Excellent! Thank you for getting back to me. Have a super party! Thanks so much for getting up at the crack of dawn (literally) so I could Skype you from Western Australia to talk through ideas for my daughter’s 8yr old birthday mystery party; it was wonderful to talk through it with you. I tend to over think (and therefore over complicate) things, so having your guidelines, templates and fun suggestions for my ‘Do-It-Your-Self Mystery Party’ has taken the stress out of organising the party and I’m actually really looking forward to pulling it all together. You’re brilliant with a capital B! Thanks again, I’ll send you an update and photos of the party.